French President Holds Firm On Clean-Energy Goals, Despite Protests A grassroots movement in France, the mostly working-class "yellow vests," objects to new gasoline taxes. French President Emmanuel Macron says he sympathizes, but the tax will stand. A "Yellow Vest" protester waves a French flag in Villefranche-sur-Saone on Saturday, during a demonstration against high fuel prices. Despite intensifying grassroots protests, the French government won't be reversing course on a gasoline tax that's designed to help the country transition away from fossil fuels. The "yellow vest" movement, which emerged suddenly this month, is driven primarily by working-class people living outside of France's large cities. France has a strong history of public protests, but the vigor of this movement has been noteworthy. 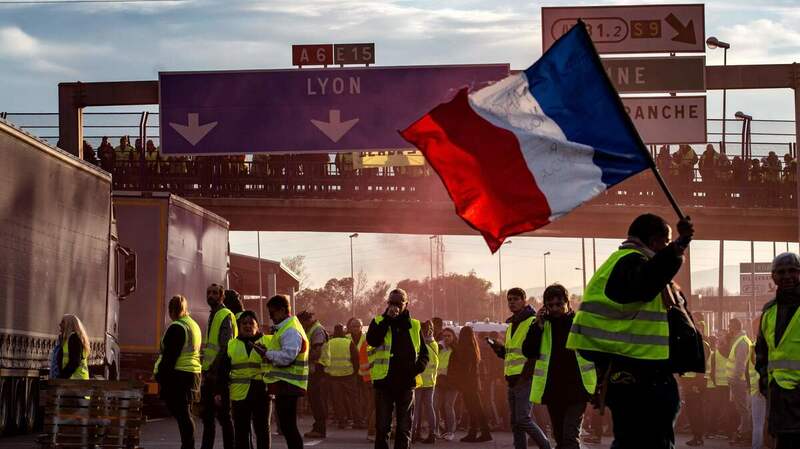 "Among its ranks are retirees and the unemployed, farmers, housewives and people who have never protested before," NPR's Eleanor Beardsley reports from Paris. "One newspaper called it the revenge of the diesel class. What unites them is the economic pinch and anger at a president who seems far removed from their daily hardships." The leaderless movement, not tied to a political party, doesn't have a clear set of demands aside from opposition to the gasoline tax. 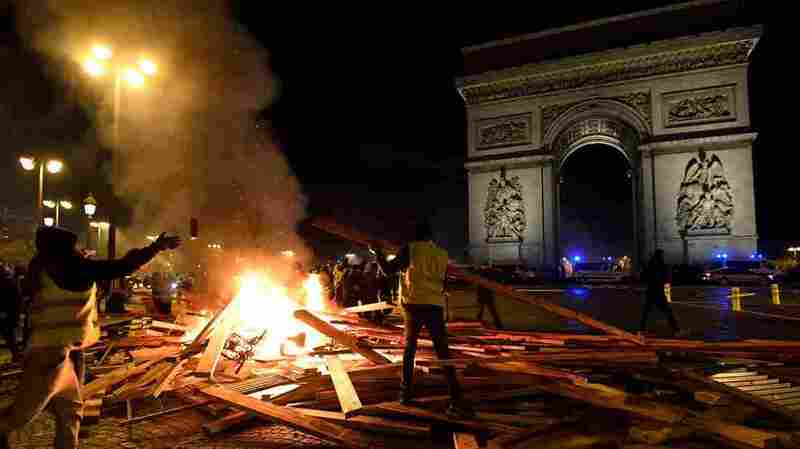 But the protest movement is speaking to deep-seated concerns and divisions in French society, and the unrest may have been brewing for a while, analysts say. A poll found that 77 percent of French people support the "yellow vest" movement. One protester in Paris told Beardsley some French people are worried about the end of the world while others are worried about the end of the month, and how they'll pay the bills. "There are two Frances: There are the better off people who live in the cities who can afford to think about climate change, and then those living in the rural areas and small towns, a lot of blue collar workers, [who] can't make ends meet," Beardsley says. "And this is where the movement came from. It rose up from the French heartland." Macron has "successfully faced down unions in his plans to overhaul the french labor market," Beardsley notes. But the yellow vest movement "is posing serious political problems for Macron and his plans to remake France." But the fuel hike isn't going away, he made clear. "What I've taken from these last few days is that we shouldn't change course because it is the right one and necessary," he said, according to a translation by The Local. "Macron did offer a concession, saying he would propose a mechanism to adjust tax hikes when they occurred at the same time as an increase in oil prices internationally — as they have this year," The Local reports. Meanwhile, even as Macron faces public opposition to his clean energy measures, he's also facing pressure from environmental groups who say he's not sufficiently committed to fighting climate change. Macron's own environment minister quit this summer in protest against Macron's environmental policies.